They say ignorance of the law is no defence and as a person who prides himself as a good, law-abiding citizen and responsible dog owner I felt it necessary to arm myself with as many legal facts relating dogs as I could. Lucky I did. Would you believe how close I came to making funny faces at a dog the last time I visited Oklahoma? This is, of course, against the law as I’m sure you already knew. Fortunately for you lucky readers, thanks to my legal delving you too are now free to travel the world safe in the knowledge that you absolutely must not, under any circumstances and no matter how tempting, allow your dog to smoke a cigar in Zion, Illinois or you surely will find yourself in serious hot water. Phew! I’m sure you’ll agree, this article is an obvious candidate to be cut out and kept safe. You never know when you might need to refer to it in the future.…. In some areas of California, animals are banned from mating publicly within 1,500 feet of a tavern, school, or place of worship. Cats and dogs are not allowed to mate without a permit. It is illegal to educate dogs. It is illegal for dogs to bark for more than fifteen minutes. A police officer may bite a dog to quiet him. 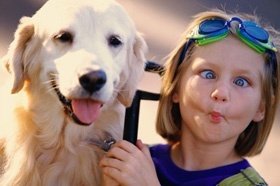 In some areas of Oklahoma: People who make “ugly faces” at dogs may be fined and/or jailed. Laws applying to some areas of North Carolina prohibit fights between cats and dogs. It is illegal to kill a dog using a decompression chamber. Have you heard of any dog laws crazier than this (well, apart from breed specific legislation of course)?